Certain business models require companies to make advance contributions for a deal - like project-specific purchases of supplies, upfront deliveries, etc. In such cases, companies may demand down payments from their customers to ensure that the customers will follow through with the orders they place. The advance payment is then to be offset with a final invoice. Now assume that a company controls their deals, involved products etc. using opportunities and opportunity products in Salesforce, and wants to create the down-payment invoices and the final invoices out of them. Enter JustOn: To cover this use case, you combine JustOn's opportunity billing and deposit invoicing. In order to hold the required invoicing data, you must add new fields to the Opportunity object. Navigate to the fields list of the Opportunity object. To define which opportunities to include in the invoice run, you create custom filters. Create opportunity filter(s) as required, following the examples below. For opportunity filters, a condition is mandatory. In order to hold the required deposit invoice data, you must add new fields to the source object, that is, the Opportunity object. ON_Type Text (255) Must be set to Deposit in order to create deposit invoices. Is cleared automatically when the deposit invoice is closed. ON_ProformaInvoice Lookup (Invoice) Shows the related pro forma or deposit invoice. ON_DepositRate Percent (3,2) If set, JustOn creates a deposit line item with an amount of Deposit Rate * Total on the deposit invoice. If both a deposit rate and a deposit amount is defined, the amount takes precedence. ON_DepositAmount Currency (16,2) If set, JustOn creates a deposit line item with the specified amount on the deposit invoice. ON_CloseProformaInvoice Checkbox Can be used to trigger the process to close the deposit invoice. Usually, a deposit invoice needs other texts on the printed document than the final invoice. You can therefore define a template detail - named Deposit - to provide appropriate texts. For further information about template details and invoice PDF contents, see Configuring Template Details and PDF Contents. Open the template or template detail to be edited. As explained in Deposit Invoice Structure, the deposit invoice lists the invoice line items as Information type invoice line items, followed by a subtotal section with tax breakdown. Optionally, you can display a line that shows the gross value for the Information type invoice line items. Closing deposit invoices requires a process that calls the appropriate Apex class provided by JustOn. The process criteria that start the execution depend on your use cases. Following the example, you want the process to be triggered when the opportunity is moved to the stage delivered. 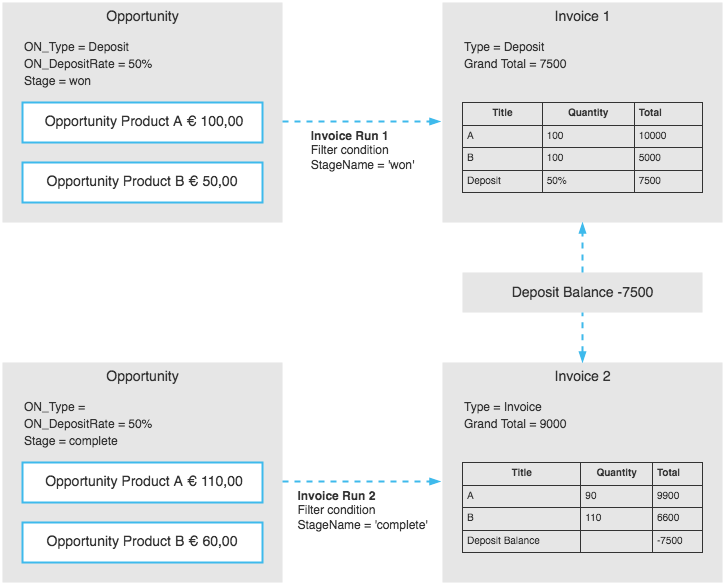 Select Opportunity as the object whose modifications are to close the deposit invoice. Define the process criteria as required. Combine the conditions with logical AND, that is, select All of the conditions are met. Select Apex as immediate action, and specify the class Close Proforma Invoice. For Object Id, set the Field Reference value [Opportunity].Id.